People using HVAC system are often overwhelmed by the question, when or how often they should change the air filter of their HVAC units. In fact, it is one of the most important things that they need to know, if they wish to extend the life of their system. Truly, changing air filters on a timely basis will help your air conditioner to work to its fullest capacity and efficiency for a long time. However, you need to make sure that you change the air filters once every 3 to 6 months or more. Each and every household is different in many aspects and this makes a lot of difference in the running life of an air conditioner. Also, there are other critical factors that determine the gap that one needs to give between filter changeovers. Waiting too long will cause the efficiency of the unit to nosedive drastically, causing a sharp rise in energy consumption, resulting in an increase in power bills. On the other hand, changing the filters frequently might be an unnecessary practice, resulting in some pointless expenses. It is imperative that the users keep in mind that a lot depends on the air filters. The more efficient they are, more often they will need to be replaced or cleaned. Take, for instance, the pleated filters. These are highly efficient filters and they do a marvelous job. Most of these filters score 60 to 70 percent in efficiency quotients, and there are certain famous companies, whose products score even more. 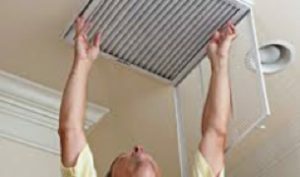 It is ideal to change or replace the pleated filters at least once in every 3 to 6 months. Again, for those who stay areas that are dusty and windy, dry and hot, then it is best to change them at least once in every 3 months. Those who are expecting their air conditioners to filtrate more efficiently must opt for electrostatic, HEPA (high-efficiency particulate air) or electronic filters. These are extremely efficient filters, and more efficient they are they will accumulate dust faster and hence will ask for more frequent cleaning or replacement. Electrostatic filters are the best choice, as it is a perfect combination of efficiency and value. These are an expensive variant of filters and might cost two to six times the cost of a fair quality disposable filter. However, the catch is that you will be able to wash and clean them, dry them when are dirty, and reuse them. Now let us talk about electronic filters. These filters will never become dirty enough to prevent airflow. They just become inefficient, and hence once that happens, their capacity to remove dirt and dust from the air minimizes as they become old and dirty. These filters need to be cleaned often and for doing that the electronic cells need to be removed and soaked in HVAC cleaning solutions and then rinsed and dried and then reinstalled for further use. It is ideal to perform this cleaning once in 3 months. HEPA filters, on the other hand, are an extremely efficient variety of filters, which get clogged by dirt quite fast. Hence, this variety of filters needs to be checked once every month and needs to be cleaned if they cause too much restriction in the way of air flow. However, this variety of filters is best replaced or cleaned by a professional. For those who are using economy panel filters from a local hardware store, it is worth opting for a pack of 4 to 5 of them, as that will be economical. However, this is not a very efficient variety of filters and might not need that frequent cleaning or replacement. In fact, these filters at times prove to be so inefficient that one can leave them intact for even a year, and then also they will not acquire not enough dust and dirt that will need changing or cleaning. Hence, the bottom line is that the type of filters used will determine the frequency of their cleaning or replacement.